to the end...the faster it goes. As our own lives roll on, is it time for a change? Or are we too set in our ways? Do we fear change? Some people dread change. Others find it a challenge. Personally, I embrace change. I always have. My husband and I have been married for over 41 years. During that time, we've lived in over 20 different homes in multiple cities. I have packed, unpacked, set up and dismantled households countless number of times. And that doesn't include the hundreds of times, I've rearranged furniture...just for the fun of it. I am a glutton for change. I thoroughly enjoy it. I get bored with the humdrum staleness of things. I seek something new and different by way of big or little challenges. Change is scary. No doubt about it. Even for me. I've made many career moves....all by choice. My entrepreneurial spirit has led me to discover new things about myself. It's given me confidence to spread my wings, take calculated risks and make life-changing choices...mostly to benefit my family. It's frightening to leave behind safe, secure employment and leap into the unknown. But I never wanted to just "put in my time" at a boring job until retirement. Occasionally, along the way, I made some wrong turns. But I learned from my mistakes and used them as opportunities to redirect and reinvent myself. I truly believe if you don't stretch yourself, you will never ever reach your true potential. You can make life changes all on your own. But it helps significantly if you have a positive sounding board. I've had support and encouragement from my husband. Even though he is very conservative, he was always willing to go along with my wild schemes and creative dreams. In the end, things worked out. Sometimes not in the way I expected but still a positive experience. I never wanted to go through life wondering..."What if I'd done that..."
On the other hand, I don't equate change with "thrill seeking". I don't free fall out of airplanes. I don't even like flying in airplanes all that much. I don't bungee jump off sky-high bridges over raging rivers. I have never zipped-lined above the treetops of an Amazon jungle. I am thinking of learning how to paddle board this summer but even that gives me some trepidation. Changing things about your life does not necessarily involve daredevil, death-defying pursuits. I know some people who have lived in the same home, on the same street, in the same town for their entire lives. They are some of the happiest people, you'd ever want to meet. Why? Because they did not remain stagnant. They faced complicated changes and challenges in their own way and emotionally moved on with no resentments.They survived and thrived without fanfare. They learned that the secret to changing oneself inwardly or outwardly is to give of yourself to others. As a result, they changed lives for the better without ever having to leave home. Yet some folks have wallowed in their status quo or "stagnant quo" and paid a hefty, lifetime price of discontent and unhappiness for not moving forward. Why? Because they are afraid. Fear is the greatest obstacle to transforming our lives. Think of all we could do if we weren't afraid. Fear is the monster wall of resistance that keeps people stuck in unhappy situations. Fear keeps us from exploring and discovering options that could better our lives and the lives of our families. Transition is not always about moving to a different town or redefining a career. 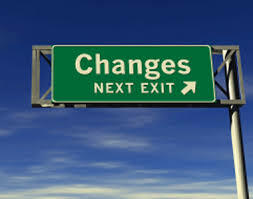 Transition or change is adjusting and accepting new possibilities. Conquering negative fears produces positive changes. Overcoming "analysis paralysis" leads to amazing transformations. Lately, I've been mindful of the spiritual and healing powers of an "open heart". We all know certain people who have closed off their heart to others for a long time. As a result, their imprisoned heart is encrusted with rust and hardened from years of negativity and decay. They have not allowed love to flow from their own heart and they have shut off any chance of love from those around them, to penetrate their closed heart. They are steeped in misery and blame others for their unhappiness. For me, change is about moving forward. Nobody's perfect, especially me. I'm an imperfect, intense, exasperating, impatient, annoying, old woman who likes to buy houses and move around a lot. But even in my own life, I've come full circle and moved back to the city of my birth. My husband and I both like the community where we live and maybe we'll stay put for a "change". I do believe we can redeem ourselves through positive changes, kindness, humility and forgiveness. I cannot force others to change. But I can create a loving change of heart within myself if I'm willing to overcome my fears. I am deeply grateful beyond measure for all my blessings and my "blisters'. 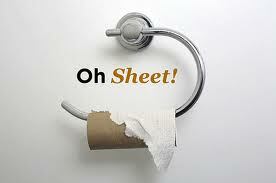 Like that dwindling roll of toilet paper, my life is spinning faster to the end. I try not to look backwards. I'm not going that way. Embracing change and remaining open to possibilities are definitely qualities that help us appreciate and enjoy life. Sometimes it takes me a little time to adjust to a particular change, but that doesn't stop me. Your toilet paper analogy is pretty apt...things are going quickly these days for me, too. Beautifully written…I want to better embrace change, myself. Great post with lots of good stuff to think about.